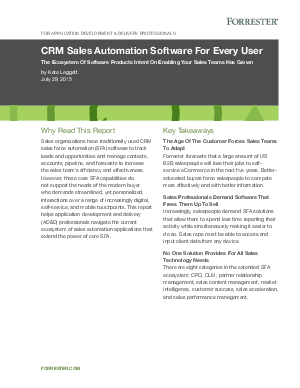 Mobile, relationship intelligence, and sales coaching are necessities for today’s sales organization and are pervasive capabilities for every sales automation solution category. No vendor solely offers these capabilities without complementing them with other functions. Instead, they are embedded across the categories mentioned above. For example, sales content management providers cannot compete without extensive mobile expertise; market intelligence and customer success do not work without relationship intelligence; and sales coaching is not constrained only to the sales performance management vendors.